Friend Brooke Gibbs has raised more than $100,000 through her "Bucks for Bauman" campaign for Jeff Bauman, who lost both his legs in the bombing. Donors have flooded crowdfunding campaigns set up for individual victims of Monday's bombings at the Boston Marathon, raising more than $1 million in a matter of days. A handful of efforts led by some victims' close friends and family members have gone viral, attracting thousands of donations from across the country and the world. "Help for Patrick and Jess" -- a campaign on crowd fundraising site GiveForward.com -- raised $200,000 within 24 hours to benefit Patrick and Jessica Downes, newlyweds who both suffered severe leg injuries. So did the "Celeste & Sydney Recovery Fund," set up on GoFundMe.com for Celeste Corcoran and her teenage daughter Sydney, both severely injured by the blast. The campaigns have now each reached nearly $400,000 and are continuing to grow, setting records for the most funds ever raised on their respective web platforms. Two other funds have already reached more than $100,000, while several others have raised tens of thousands of dollars. A few newer ones have raised a few thousand each. "All of those people that were wondering what they could do to help, they suddenly had a resource," said Desiree Vargas Wrigley, chief executive officer and co-founder of GiveForward. "Most of these campaigns have exploded because of social media." The campaigns appeal to both friends and complete strangers because people can give in a more personal way and see more immediate results, she said. Many of the organizers provide detailed descriptions of the victims and have already begun posting photos and updates on their condition. "People get angry. They want to get involved. They want to help," said Brad Damphousse, chief executive officer of GoFundMe. "Crowdfunding is actually really empowering for donors." The fundraisers' beneficiaries all suffered severe injuries, and are expected to incur hundreds of thousands of dollars or more in medical and rehabilitation costs. 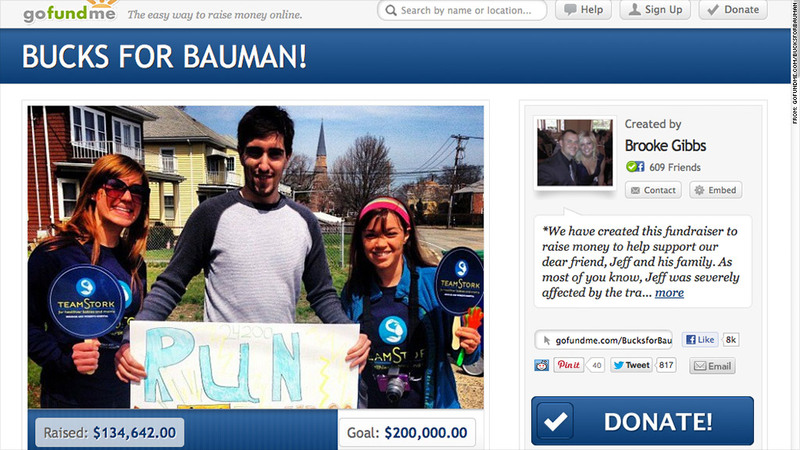 *Medical bills are going to start rolling in, let's get a head start on helping out Bauman and his family. Every dollar counts!" organizer Brooke Gibbs wrote on her "Bucks for Bauman" page for Jeff Bauman, who lost both of his legs in the bombing and was the subject of a widely publicized photo showing an ashen Bauman being aided by a man in a cowboy hat. By Friday morning, the fund had raised more than $135,000. Broader funds to help all 183 victims have also been created. "The One Fund Boston," established by Boston Mayor Tom Menino and Massachusetts Governor Deval Patrick, has received millions of dollars in corporate commitments. Another campaign, "Technology supports victims of Boston Marathon Bombing" by local nonprofit Technology Underwriting Greater Good, said it raised nearly $200,000 as of Friday morning. That effort is also being aided by web fundraising efforts. Both GoFundMe and GiveForward, which charge transaction fees of about 5%, employ a variety of safeguards to deter scams and ensure that the funds go to the intended victims. GoFundMe requires organizers to link efforts to a legitimate Facebook profile and has a team that vets any suspicious campaigns. GiveForward assigns a live "fundraising coach" to each campaign, who both vets and guides the efforts, and will only write checks in the name of the named beneficiary, not the campaign organizer. The campaigns have grown quickly as friends and family members of the victims tap their networks to get the word out, Damphousse said. For example, the "Ann + Eric Whalley Recovery Fund" had raised more than $65,000 by Friday morning. The Whalleys, whose 25-year-old son Richard attended Massachusetts Institute of Technology, were enjoying a walk along the marathon route when the bombs went off. RIchard's former classmate Praveen Subramani learned on Facebook that both of Richard's parents had been severely injured by the explosions, and set up the fund on Tuesday from Santiago, Chile, where he is currently a Fulbright scholar. The MIT network immediately jumped to action to promote the efforts. "It's been an incredibly testament to the power of networks and also technology to enable these kinds of things," Subramani said. "It's been a tragic experience, but also one that has contained a lot of hope for us." The "Celeste & Sydney Recovery Fund," started by Celeste Corcoran's cousin Alyssa Carter, was originally set up with a goal of $20,000. Celeste lost both her legs in the bombing while her daughter Sydney, a high-school senior, suffered severe injuries from being hit by shrapnel. Alyssa used her large family's Facebook network to promote the fund, and said the family has been touched by the overwhelming response from across the country and the world. "It's just so much easier for them to focus on recovering and not thinking about everything that they're going to need," Carter said Friday morning. "Celeste is going to need lifelong support. They're going to need modifications to their home, prosthetics. It's going to be a struggle."